A SunLouvre Pergolas makes it possible to close and open the roof louvers according to the weather. Thus, you get a protection against the sun and the rain on your terrace when the roof of the pergola is closed. Moreover, when needed, you can enjoy the clarity and warmth of the sun’s rays by opening the roof. 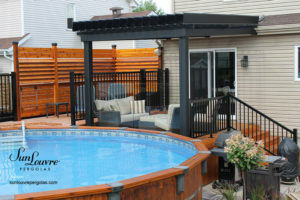 These pictures demonstrate some of our pergolas projects. 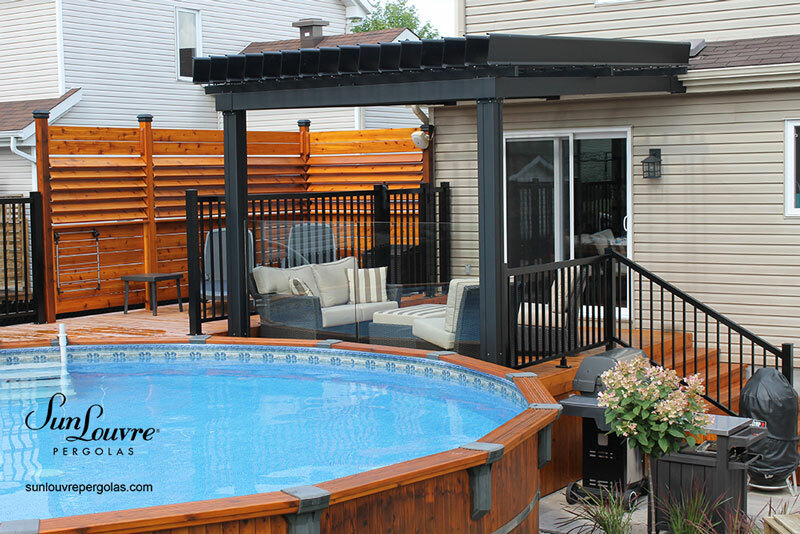 Consult the Products and the Frequently Asked Question pages for more details on our pergolas or download our Brochure. 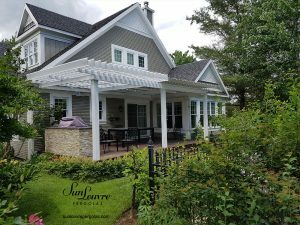 This project of an aluminum adjustable louvered roof pergola is custom-made. 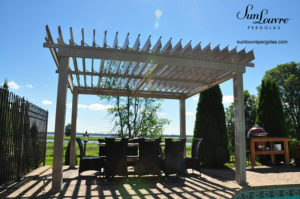 This white Classique model pergola is attached to the home and includes two independent adjustable roof sections. Thus, it is possible to leave one section of the roof open and the other closed. 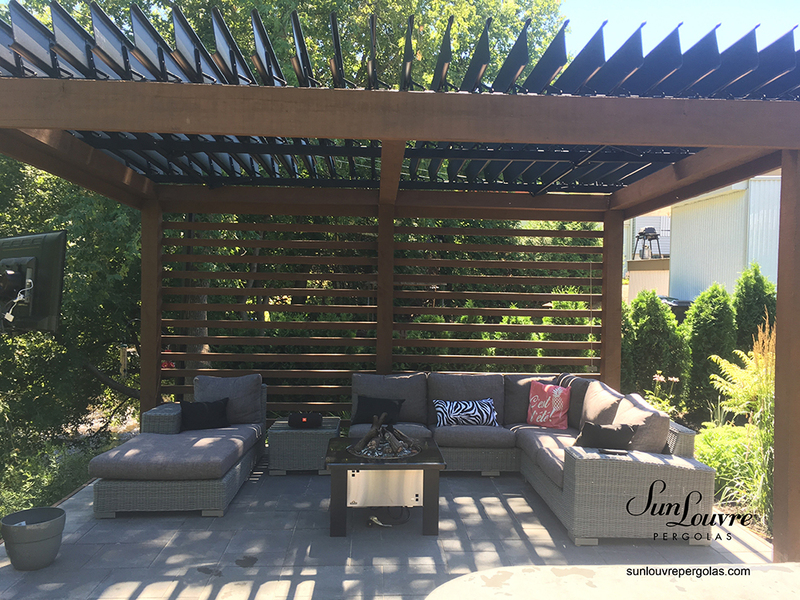 This project of an aluminum adjustable louvered roof pergola is custom-made. Therefore, this black Integrated Louvers model pergola is attached to the house and includes two independent adjustable roof sections. Moreover, this model also includes an integrated gutter letting the water drain at the bottom of one post. 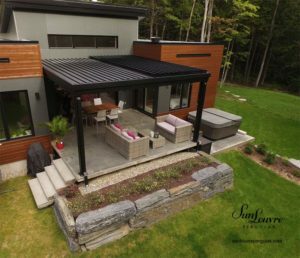 This project of an aluminum adjustable louvered roof pergola is custom-made. In this case, this Classic model pergola is attached to the home and the pergola roof is adapted to marry the form of the chimney. 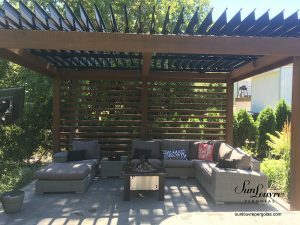 This project of an aluminum adjustable louvered roof pergola is custom-made. 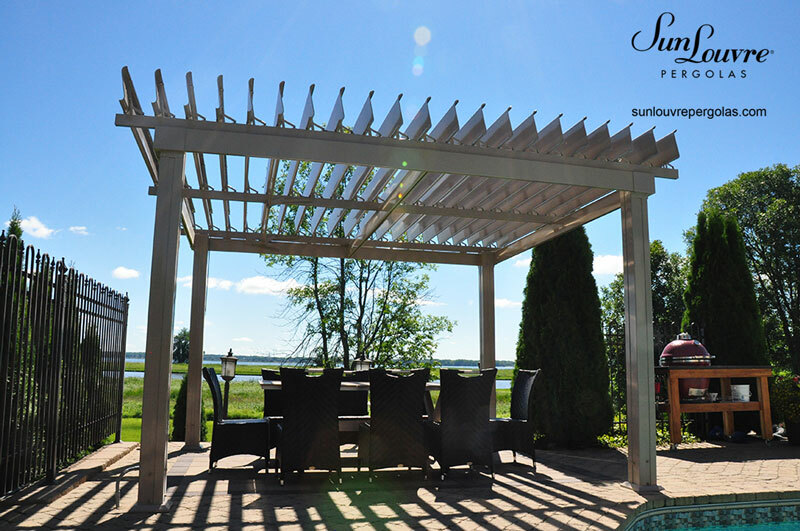 In fact, this SunLouvre Pergolas is installed on the existing customer’s wood structure. In addition, the customer made a wood vertical wall offering a nice privacy touch. This project of an aluminum adjustable louvered roof pergola is custom-made. First, this Classic model pergola is installed on a raised balcony and the pergola structure is attached to a part of the house roof. Secondly, the louvers exceed the balcony surface to offer a sufficient roof covering. Finally, the glass railings are integrated to the posts for a more uniform design. 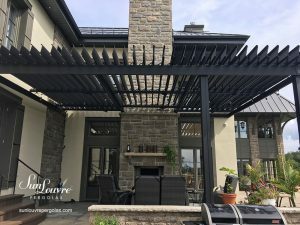 This project of an aluminum adjustable louvered roof pergola is custom-made to fit with the terrace. 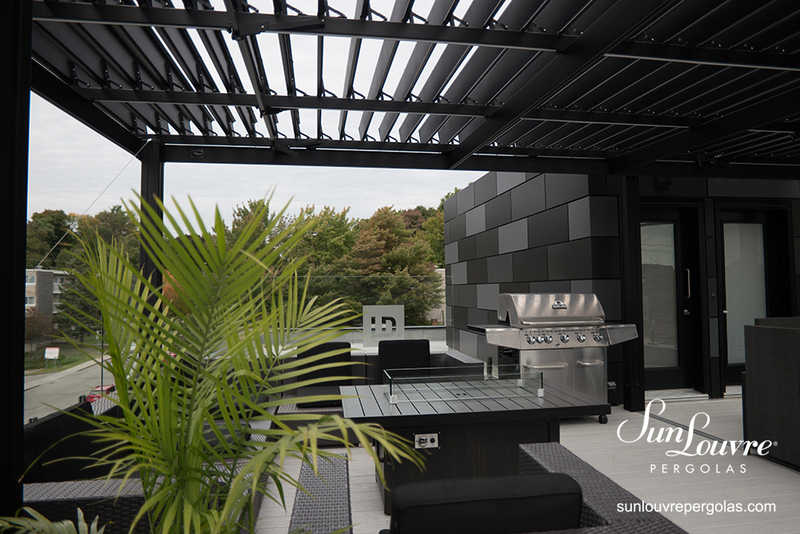 Like all our projects, we positioned the louvers according to the sun orientation to get more clarity when the roof is open and to create shade when it is closed. 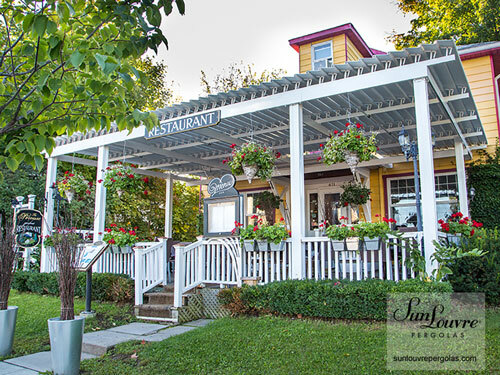 This project of an aluminum adjustable louvered roof pergola is custom-made for a commercial customer. 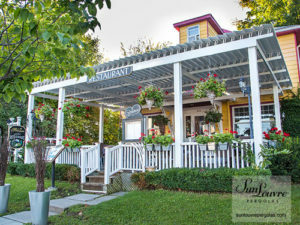 In fact, the pergola is installed on the rooftop of a building. Thus, employees have access to a comfortable relaxation area that allows them to fully enjoy this nice environment regardless of the weather. The bioclimatic pergola roof can then be closed in case of rain. 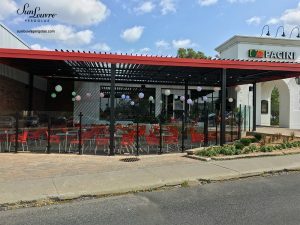 This project of an aluminum adjustable louvered roof pergola is custom-made for La Pérouse restaurant in Bromont, Québec. As you can see, the high part of the pergola roof is attached to the wall of the building. The large roof surface required to be supported by six posts. And the middle posts can be positioned strategically if needed. Here’s a nice way to increase the number of places in a restaurant and thereby its turnover. 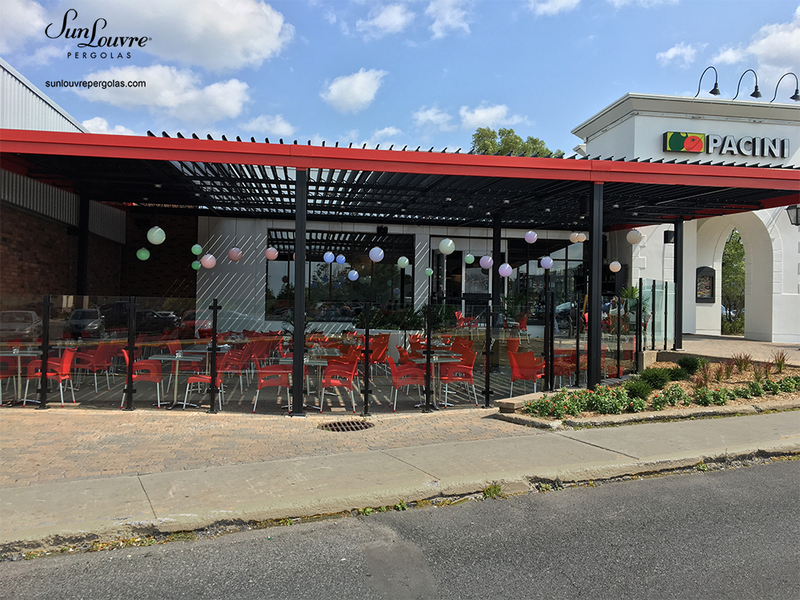 This project of an aluminum adjustable louvered roof pergola is custom-made for the Pacini restaurant in Longueuil, Québec. In fact, the roof beams of this Integrated Louvers model are painted in red to match the restaurant colors. Also, the addition of lighting under the pergola is an interesting option to create a personalized touch, like these round multicolor lights.